Over the last couple of years, America has seen the multiplication of the so-called "cord cutters", millions of people who decided it is not worth it to pay for cable television. A recent study by SNL Kagan revealed that the number of subscribers to cable, satellite, or fiber TV services fell by more than a quarter of a million in 2013; the first time the industry registered a full-year period decline. And the future doesn't look very bright. According to a Verizon survey, millennials (aged 16 to 34) are considerably less likely to have a cable or satellite subscription than those aged between 35 and 64. The interesting thing about this generational divergence is that the young "cord nevers" do not watch less television. Instead, their viewing time has gravitated towards an emerging media: the Web TV. As the conventional paid TV model looses ground to internet television, new opportunities arise for the development of technologies aimed at exploring this blooming market. Companies investing in new and improved web TV solutions may be entitled to significant federal R&D tax credits. Web TV, often referred to as over-the-top (OTT) internet television, is defined as the delivery of professionally produced filmed content via the Internet. A recent study by Research and Markets found that by 2017, the sustained viewership of OTT internet TV programming will reach 373.1 million households or 1,189 million individuals. This explosive growth is even more impressive when compared to cable TV data - it took over 30 years for the cable TV industry to reach 550 million households, by the end of 2013. An essentially innovative concept itself, internet TV thrives on innovation. Proof of that is the production of original web TV content, such as Netflix's award-winning House of Cards, which is the most streamed piece of content in the U.S. and 40 other countries. Launched in 2007, Hulu, an online video service that offers free streaming of TV content, is also an example of innovation. Backed by major media companies, namely, Fox, NBC Universal, and Walt Disney, the video site is based on a unique business model which has attracted more than 6 million subscribers. With an intuitive user interface, a wide catalog of free content, and a powerful search engine, Hulu's success is built on technological innovation. In the words of former CEO Jason Kilar, who refused to outsource the website's design and coding, "Technology is the source of our competitive advantage. For us to design the company to last, we had to write every line of code ourselves." The following sections will discuss various aspects of the technological innovation fueling the rise of Internet TV. With over 48 million subscribers around the globe, Netflix is the world's leading Internet television network. The web TV giant has mastered the use of big data in the determination of business strategies. Creator of a system that gathers information on users' viewing habits and preferences, it is safe to say that no one knows more about audiences than Netflix. Data collected in a single day includes 30 million plays (meaning every time a user rewinds, fasts forward, and pauses), 4 million ratings, and 3 million searches. In addition, movies and TV shows are annotated with hundreds of metadata descriptors, or tags that help build profiles based on users' choices. To take advantage of all this information, Netflix has designed a series of personalization algorithms that, among other things, aim at making relevant content suggestions to different kinds of people. Big data analyses have also corroborated the creation of highly successful original content. Netflix is an iconic example of how innovative predictive analytics systems can help web TV providers know what people want even before they do. Online TV is attracting cable and satellite providers, which struggle to remain competitive. Overcoming the technological challenges involved in this transition requires significant innovation. Dish Network Corporation, America's second largest satellite TV operator, is the creator of Dish Anywhere, which enables users to watch live, recorded, and on-demand TV anywhere, from any connected device. The technology is based on Dish's 'Hopper' with 'Sling', a DVR system that makes it possible to access anything that DVR can output, anywhere - provided the user logs onto the Internet on a browser or has the Dish Anywhere app on his mobile device. Dish is expected to introduce a new DVR-free internet TV service in the near future. It would be the first company to sell a full package of live-streaming channels over the web. The new technology would be targeted at young people who want to pay less for TV and watch it on smartphones and tablets instead of on traditional TV sets. AT&T has also announced its plans to launch a web TV service by the end of 2014. Simple TV is yet another example of an innovative application that allows users to watch television online, no matter where they are. When connected to an aerial antenna, the TV server streams content to users' devices, such as smartphones, tablets, and computers. By working with broadcast television and over-the-air channels, it eliminates the need for a cable subscription. Simple TV Premier subscription costs $59.99 per year and allows users to record, watch, and pause live TV. It also offers unlimited global streaming to up to five simultaneous users. Headquartered in New York, startup Aereo is also engaged in the transition between conventional and web TV. The company developed an innovative system that allows users to watch and record over-the-air television on any internet-connected device. 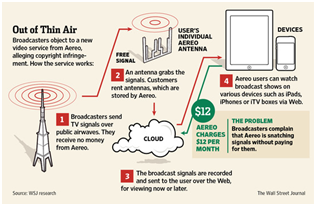 Aereo functions through dime-size antennas, which collect broadcast TV signals and deliver them as streaming media. The system has generated great controversy, as major broadcasters question its legality. Companies like ABC, CBS, Fox, and NBC have pursued legal action against Aereo, arguing that its services infringe on their copyrighted content. Though lower courts have ruled in favor of Aereo, the case is now to be judged by the Supreme Court. Aereo's potential victory would be a green light to innovation linking traditional broadcast TV and online streaming. The undeniable fact is that a growing number of consumers demand to watch only what they want, when and on the devices of their choosing. The emergence of internet TV has also fostered innovation in consumer electronics. A growing number of devices have been specially designed for online streaming. Launched respectively in 2007 and 2011, Apple TV and ROKU, which are both in their third generations, pioneered the digital media streamer market, threatening the dominance of disc-based electronics. 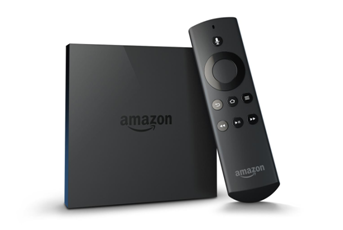 Unveiled on April 2, Amazon Fire TV is the most recent entrant to the web TV electronics market. Designed by Amazon.com, the new set-top box aims to outperform its rivals by combining power and simplicity. The innovative device was conceived by targeting the challenges and problems left unsolved by competitors. In order to overcome searching limitations, for instance, Fire TV includes a microphone-enabled remote control for voice search. Likewise, Amazon created the ASAP, a software that uses viewing habits to anticipate what users will watch and preload content, avoiding common performance problems. In addition to streaming videos, Fire TV allows users to play video games downloaded from Amazon's app store. It features streaming video apps from competitors, such as Netflix and Hulu, and include a price comparison tool that tells users the least expensive app from which to watch a program. Through its innovative device, Amazon will be able to control the way its instant video service appears to consumers, overcoming the previous reliance on gadgets from competitors. 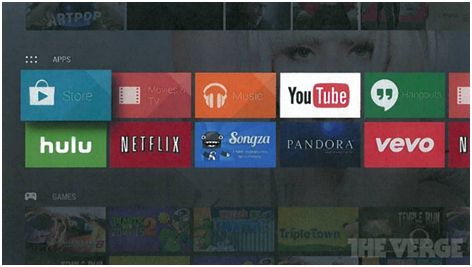 Also, Fire TV will be used as a tool to gather information on viewers and to promote products and services. Google, which so far offers streaming through the Chromecast dongle, is expected to launch the Android TV in late June. Rather than a new device, it will be a platform that manufacturers of TVs and set-top boxes will be able to incorporate. The idea is to develop a go-to platform for smart TV manufacturers, mimicking the role of the Android platform for smartphones. The list of media services providers and hardware partners involved in the project should be announced at the Google I/O Conference in San Francisco. Speculations are that the new Android TV will not replace the successful Chromecast, which can be plugged into any HDTV and controlled with smartphones, tablets, or laptops. On the contrary, Google recently announced it wants to expand the dongle to a number of international markets, partner with consumer electronics companies to bring cast functionality to other devices, and encourage the multiplication of Chromecast-compatible apps. Specialists conjecture that both products will communicate, with Android TV being Google-cast capable. One of the world's leading manufacturers of electronic products, Sony Corporation has considered web TV as a means to promote growth through innovation. Last January the company announced its intention to sell internet TV services via its Blu-ray players and PlayStation consoles, which would become streaming hubs. There are more than 70 million web-enabled Sony devices in American homes, including 25 million PlayStation 3s, the most used device for watching Netflix. Internet is more prevalent than ever when it comes to watching TV. The ability to choose what, when, and where to watch has gained unprecedented value to a new generation of consumers who want to turn their computers and mobile devices into new entertainment hubs. As the "cord-cutting" movement gains momentum, novel alternatives of over-the-top television emerge, fostering innovation in the consumer electronics industry and generating a wealth of information that promises to advance the field of predictive analytics. Companies engaged in Web TV innovation should take advantage of federal R&D tax credits to increase their chances of success in a promising and yet increasingly competitive market.